On Premise or Cloud ERP. Which is more secure? 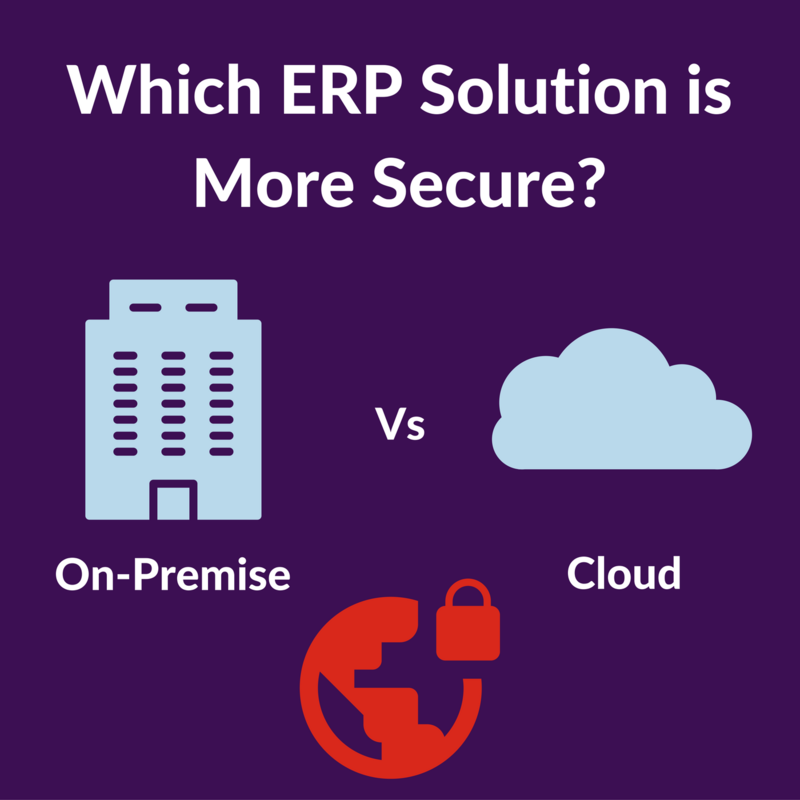 ERP Data Security: On Premise or Cloud ERP. After spending a couple of years at cloud specialist iomart, I have developed an understanding towards the issues and concerns around the rise of cloud computing. Chiefly the ongoing concerns over data security. With this in mind, it’s been interesting to start learning about cloud ERP versus on-premise since joining Optimum a few months ago, given that a businesses ERP software holds vast amounts of data. If you are considering a new ERP system for your business, you now have to make a key decision regarding the platform and infrastructure approach: should you pick a cloud ERP -hosted service or a locally-hosted ERP solution. The differences between these services has led to ongoing discussions about the costs, benefits, pros and cons, and also, crucially, the security of the data being managed. ERP systems collate data from every function of a business and allow for this data to accessed and analysed. So obviously the security of this business critical data is paramount and is a key consideration for any business deciding on the future direction of its business software. To remain with on premise infrastructure or move to the cloud? There are of course advantages and disadvantages with both platforms and choosing between these ERP platforms will depend on various factors. A key factor with cloud-based services is the fact that you would be trusting someone else to host your data. A lot of businesses still aren’t comfortable with that. Cloud computing is all about storing and accessing data, programs and applications such as a cloud ERP system, over the internet instead of storing and accessing the same thing from a computer’s hard drive or a server on premise. So are concerns of security well founded or is it time to move to the cloud? On premise software requires in-house server hardware, software licenses, integration and active support from the IT department of an organisation. This can often result in in-house ERP software and implementations being more expensive than cloud-based solutions. Plus, you then include the on-going maintenance required to ensure the functionality drives continuous value. Tasks including potentially substantial upgrades and realignments will also add to the overall cost. So choosing to remain on premise may have financial drawbacks that have to be balanced against the the concerns over data security. Data security is not just a problem for the cloud. In a recent study of IT decision makers by BT, 49% of the respondents said they are ‘very or extremely anxious’ about the security implications of cloud services. The study showed that for 76% of the respondents, security is the main concern when it comes to cloud-based services. 41% percent of the respondents also believed that all cloud-based services are ‘inherently insecure’.This means that a large population still remain doubtful about cloud services. Most security breaches happen as a result of employees. The internet of things significantly contributes to this increased vulnerability. Mobile phones, tablets, laptops and even watches are constantly being taken from insecure home or public internet connections into a ‘secure’ workplace network. This results in the security of a workplace network being dependant on an employees diligence and technical know-how to ensure their devices do not expose an internal threat. Considering that cloud-hosted data is on secure servers and usually located in multiple locations, this does reduce the risk that having all your business data in one location can bring. Even if a security breach does happen, the cloud service provider company will alert customers and act swiftly to support and resolve the issue. After all, it is their reputations and business that is at stake as well as yours. In summary, security concerns for how best to implement an ERP solution should of course be considered with the utmost importance. However, don’t always just assume that on-premise is necessarily more secure than cloud ERP software.